There is a story connected with the Underground Railroad in countless communities throughout the North. Old houses have secret tunnels leading into the woods, attics with hidden stairways. The “railroad” was a network of friends who helped slaves escape to freedom in the North and on to Canada before the Civil War. 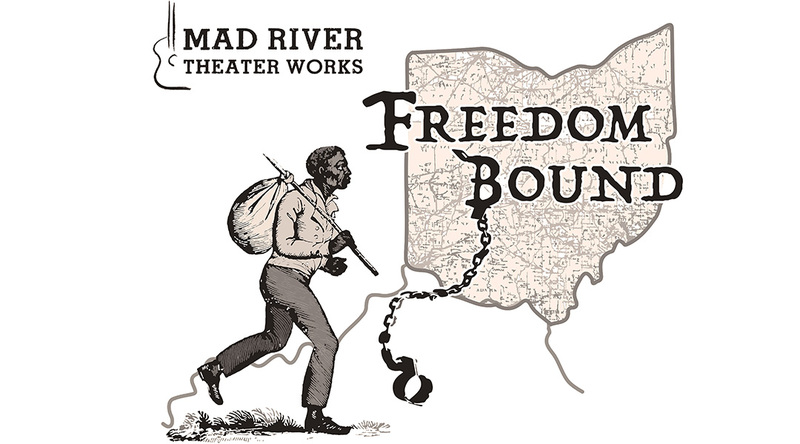 This turbulent period of history is the subject of Freedom Bound, a one-act play with music by Mad River Theater Works. Freedom Bound revolves around the most famous incident in the history of the Underground Railroad in Ohio: the story of Addison White, an escaped slave, and his rescue by the citizens of the town of Mechanicsburg, Ohio. Freedom Bound brings history to life through original songs and an array of characters that pop right out of the past to relive the turbulence and hope of the UndergroundRailroad right before your eyes.